Technical Car Experts Answers everything you need: Toyota solara rattling in rear? Toyota solara rattling in rear? There are many possibilities,that can cause this problem. A faulty rear struts can cause this rattle. A problem with upper strut mounts. 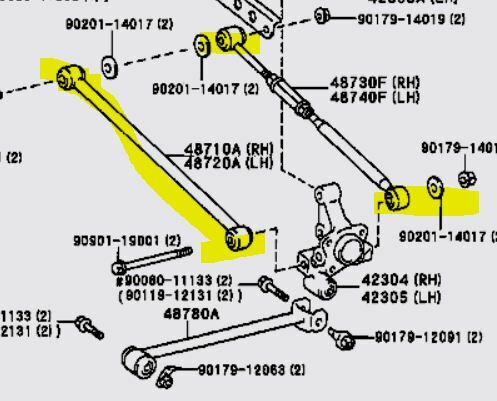 A rear sway bar links. A problem with rear cross bars. Replace all four links the two that are adjustable for the tow setting and the front 2. They are 2 bars that cross the rear end of the car diagonally. On the rear the vehicle there are two trailing links the furthest one to the rear is adjustable and sets the toe. The front one is just a link to stabilize the suspension. Where these bolts of the steering knuckle the joint gets worn and will cause a rattle type noise over bumps is easy to overlook. With the wheels off the ground in the rear grab the tires and apply force to the front and back sides of the tire and see if you have any free play or movement in the forward bar outer joint at the knuckle.. These are known to wear. To do this normally the whole suspension has to come down to get the bolt out or the tank has to be dropped. Also in some cases body cracks up in the strut tower and have to add felt paper between the strut top and the body but that is rare. That can cause this rattle in rear side of Toyota Solara vehicle. This details will help to inspect and confirm the problem. Replace door stay assemblies on Toyota? How to Replace rear quarter glass on Toyota Tacoma? Overdrive light in the dash blinks? How to bypass immobiliser on Rover 200?